Exciting news.....I am cooking something worth blogging tonight! Hold onto your hats people!!! So a bit of back story........Our extended family generally spends Christmas at Mooloolaba, Sunshine Coast, Qld. This tradition started with Andy's family when he was young and we have continued joining in on this tradition as much as we can, especially now that we have Charlie and we just love it (as long as it is not raining all the time like it was a couple of years ago). It is always such a food adventure (and I am using that term slightly sarcastically) travelling to the Sunny Coast with Andy especially in the last few years.........I think things have improved somewhat from when we first started trawling the coast looking for Asian ingredients, but initially it was struggle. It is certainly much harder than travelling down the road to Footscray or the Victoria Markets here in Melbourne. Of course this always makes me appreciate where we live even more - the sunny coast may have the weather, the beaches and the bronzed beauties....but hey, Melbourne has an abundance of amazing fresh, and packaged ingredients from all over the globe and many of the best restaurants, so I know where I would prefer to be shaking my lilly white buttocks! So to get to the point - one Christmas we were lucky enough to receive as a present vouchers to Spirit House. Wow, this place is awesome. The grounds are so beautiful and the food is just delicious. We got this gift a few years ago so I am not going to go into detail about the restaurant experience as I don't think that is fair to Spirit House. When I go there again I will blog about it when it is fresh in my mind. We have many cookbooks from Spirit House and one of my favourites is 'Hot Plate' (BBQ recipes from Spirit House chefs). I love this book because I love meat that has been cooked on the BBQ. 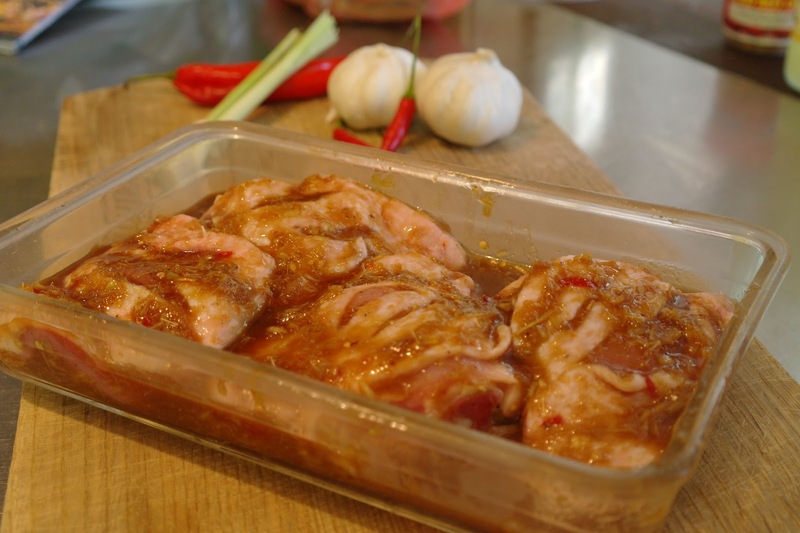 Tonight I am cooking Char Grilled Chicken (marinated with lemongrass and chilli). Pound and combine to a marinade paste. Score the chicken (the recipe calls for 1 medium chicken butterflied but I have gone with just under 1kg of chicken chops instead). 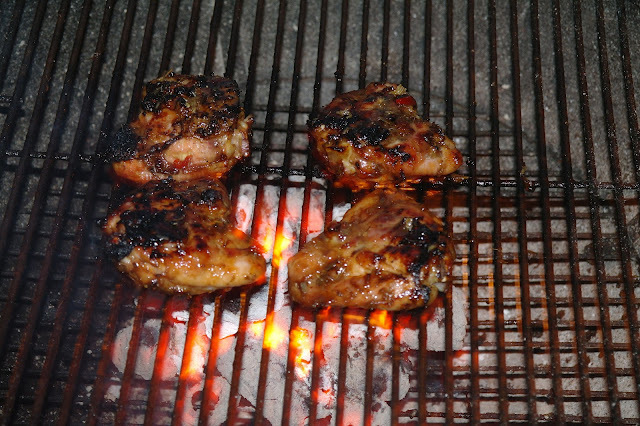 Rub marinade over chicken and leave to marinate (overnight if possible). *With your saved lemongrass tops - tie them together with some string to make a brush. I run a knife through the top parts and then fray them out a bit to make a better brush. You will use this when cooking to baste the chicken with the marinade. 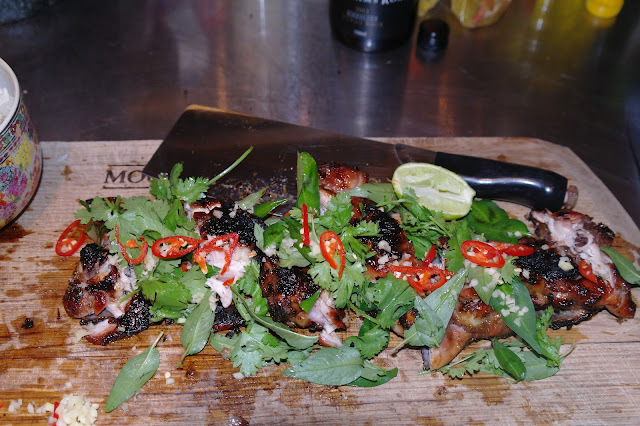 After a few glasses of wine we fired up the BBQ and put the sticky rice on to cook. Baste the chicken with some oil and put onto the BBQ. The chicken needs to be sealed over medium heat and then cooked for about 30 mins on low. 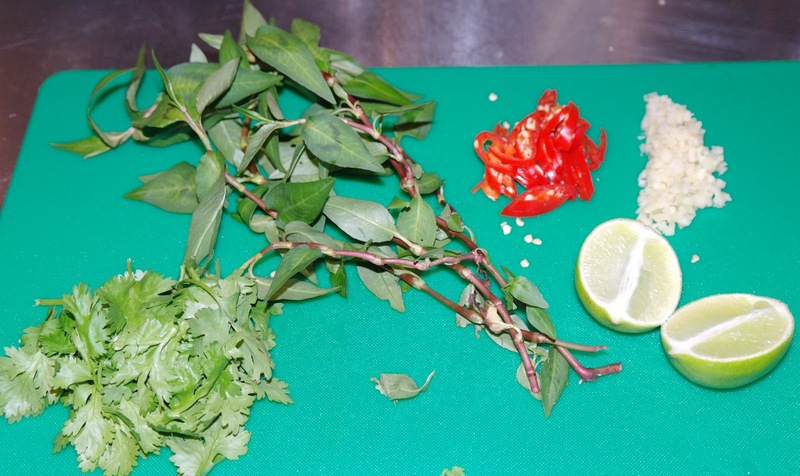 While you are cooking you need to baste the chicken with the marinade every 5 mins using the saved lemongrass tops. 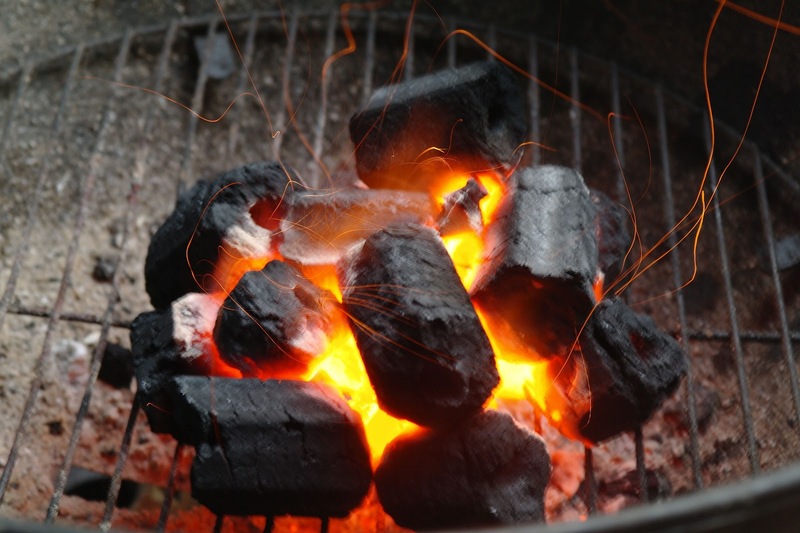 I found cooking over coals tricky to maintain the right heat. We use the fan to ramp up the heat for sealing and then let it die down to cook for the 30 mins. This worked a treat but I found that every time you basted the chicken it would cause the flames to fire up. This is not a problem as long as you are keeping a close eye on it and move the chicken around so that it is not sitting directly under the flames. While the chicken is cooking chop up on a board 2 tbsp Vietnamese mint, 2 tbsp coriander leaves, 1 red chilli, 1/4 tbsp ginger and chop 1 lime in half. 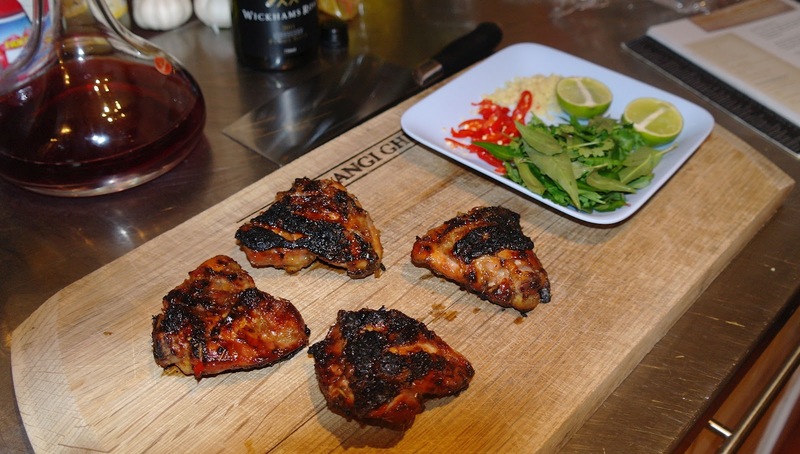 When the chicken is cooked, chop into pieces and rub with chopped herbs. Squeeze over lime and serve with sticky rice. This was so yummy. I may have slightly overcooked the chicken (I blame bad lighting and a tricky BBQ) but it was still delicious! I will be making this one again.